Cooler weather has me in the mood for pasta, only with heartier sauces than the recent fresh cherry-tomato braise. It’s time for pasta all’amatriciana, made with lots of pancetta, tomatoes, garlic, red pepper, and pecorino cheese. It’s a simple sauce, certainly greater than the sum of its parts: finely chop 8 oz thin-sliced pancetta and brown in a skillet until the fat is rendered and the pancetta crisps. Then add a minced clove of garlic and a generous pinch of red pepper and saute until the garlic is fragrant. Next, add 1 cup of finely diced, peeled and seeded tomato (canned is fine, but drain it a bit before using). Bring to a simmer, reduce heat, and cook gently until the tomatoes break up and the sauce thickens. Just before serving, stir a generous handful of finely grated pecorino romano cheese into the warm sauce. I like to use a long, hollow pasta shape for Amatriciana; Luxury brand long macaroni (aka “maccaroncelli) is my go-to choice. (The Italians often use bucatini, which is thinner than long macaroni, but has the same long, hollow, tubular shape.) And when the bucatini all’amatriciana is gone, it will be time for meatballs made with pork and veal, simmered in a slightly-sweet marinara sauce and served over a tangle of spaghetti. Maybe by then I’ll be tired to tomatoes and move on to spaghetti carbonara….and gnocchi with spinach and brown butter…and perhaps even some homemade crabmeat ravioli? Jeeze, this sounds good. I haven’t tried the long macaroni but have used the bucatini and love it. Great post, Celeste. 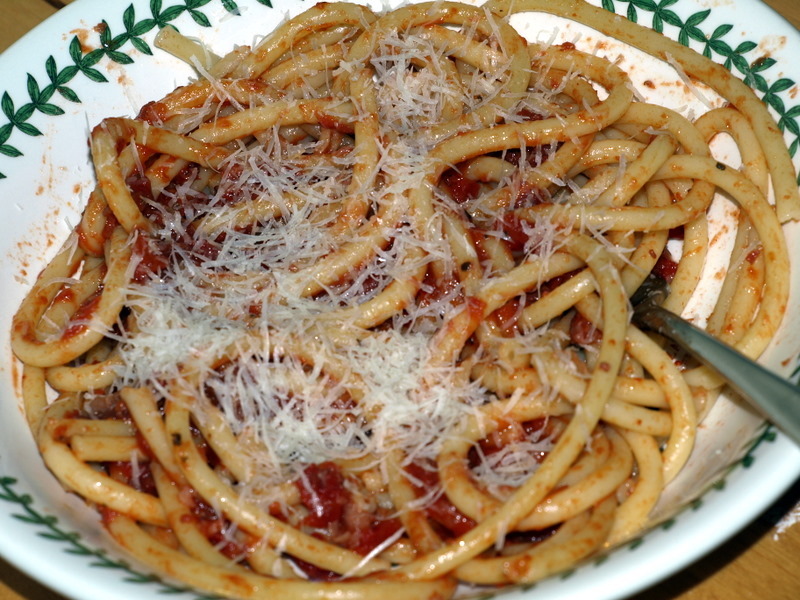 The Amatriciana we had in Rome (and I believe the classic) was made with guanciale from the jowl. They sometimes have it at Butcher. It’s a great hearty flavor. Indeed, I have some of Butcher’s guanciale in my freezer…but truth be told, I like the pancetta version a bit better (“cinque p”–pancetta, pomodoro, pepperoncini, pecorino, and pasta). On the other hand, I do like the guanciale flavor in pasta alla gricia (guanciale and pecorino only). Know what you mean and love the cinque p! A little guanciale can go a long way and can use the pecorino to stand up to it.